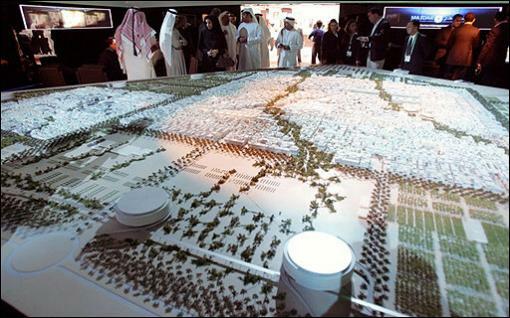 The world’s first car-free, zero-carbon city is slated to rise near the Persian Gulf by 2013. Even though it derives almost all of its wealth from oil and gas, the emirate of Abu Dhabi is making a splashy effort to wean itself from fossil fuels, reports Agence France-Presse. Crown Prince Sheikh Mohammad bin Zayed al-Nahayanis has committed $15 billion towards the construction of a new city, called Masdar (Arabic for "source") that will house 50,000 people in a car-free environment and run entirely on renewable energy, mostly solar. Dhabi Future Energy Company (ADFEC), told AFP. in Abu Dhabi, capital of the United Arab Emirates (UAE). Take that Qatar, with your measly little mist-cooled bike lanes! Masdar represents a far different approach than the Corbusier-of-Arabia style of urban planning we’ve seen in neighboring Dubai, but those promises of livability may be undermined by the city-state’s chosen form of public transportation. Streets won’t have to handle any car traffic. Rather, they will be criss-crossed by elevated Personal Rapid Transit guideways, a favored transportation mode of highway builders and cartoon villains. And while PRT might not make for the friendliest pedestrian environment, how nice does public space really need to be when the daytime temperature hovers around 90 degrees five months of the year? The green-washing of the Persian Gulf comes not a moment too soon. The United Arab Emirates currently has the world’s largest per-capita "ecological footprint:"
of Americans according to the World Wildlife Fund. Actually, PRTnut, that’s exactly what has happened in Minneapolis and other places. PRT was used as a way to siphon transportation funds and support away from immediately viable light rail and bus projects. I say go set up a PRT project in Dubai or some Chinese city where, for the moment, the sky’s the limit when it comes to infrastructure spending. If it works there and proves itself to be viable and cost effective, let’s try it out in the US. In the meantime, we’re going to be busy promoting smart growth and rebuilding our national rail network. Actually, I don’t drive either. I ride a bike for most of my trips, transit, air, and car rental/car sharing for the rest. I was speaking metaphorically of “we” as the vast majority of metropolitan-dwelling Americans who drive for most trips, and use transit mostly for park&ride to work type trips, if at all. That is the American norm, not NYC. Since many people do have a distaste for riding with strangers, we might have more success increasing transit ridership if we to provided a service that fills that demand without most of the negatives associated with private auto use, rather than trying to find ways to force people to use a service they don’t want to use. Counting on higher energy costs to force people en masse into conventional transit is a mistake, IMO. Rising energy costs hit transit too, and they hit hardest on a per-passenger basis at the least-used, least attractive suburban services. The net effect of rising energy costs for transit will probably be positive, but not by much, because so many underused systems have terrible energy efficiency, and would need very large increases in ridership to offset the rise in energy costs. Trains and buses are heavy, and they must move regardless of whether they have many or any passengers, to maintain acceptable headways. So the occupancy ratio is quite low for most transit systems. Conventional transit also stops and starts frequently, which wastes a lot of energy. PRT vehicles are small and light, they usually don’t move unless they have at least one passenger (a .25 occupancy ratio), and they don’t stop until they reach the destination. The result is the best energy efficiency of any form of motorized transportation. I would also dispute the idea that surface solar will never be practical. There is plenty of solar energy to tap, more than enough to meet all energy needs, though at a very high price. But the technology is getting steadily better and cheaper. If the technology keeps advancing, solar energy will be cheap enough to support widespread electric car use within 30 years. Transit investments can help make walkable and bikable communities possible. However, a lot of money has gone into rail systems that rely on park and ride lots, an investment that will arguably worsen sprawl and increase energy consumption and emissions. I never said anything about new systems, only the ones that have already been built. How much public money was actually spent on PRT in Minneapolis? I can understand a reluctance to spend public money on an untried system. But you don’t get progress without taking risks. It’s a shame that the US has surrendured leadership in public transportation research and innovation. PRT is far enough along that a pilot project is well justified. And a pilot project is near completion at Terminal 5 in Heathrow airport. Masdar in the UAE will also use PRT. Once hard, experience-driven operating numbers are available for PRT, it should be included in any alternatives analysis for a new transportation project. I think that once we get past the first two or three successful applications, and people and agencies realize the advantages of PRT in terms of service, energy, construction, and operating cost, there will be a wave of PRT projects comparable to the light rail boom of a century ago. Fooled me! Good for us then. I think “we” will be fine as far as transpo is concerned, but we may not be able to stop the suburbs from pumping every last drop of oil out of the ground. I’m not ruling out any options for slowing them down. This is the unicorn we have been chasing the past half century, while our transit systems only fall further behind those in Europe and East Asia. American drivers, addicted to persona-defining cars, have a line of excuses of which “I hate the attitudes on the subway” is just the beginning. If it’s not stranger danger, it’s the condition of the upholstery or the lack of an award-winning bass system. Economic “force” is a fact of life. I’m forced to go to work, forced to not have a maid, forced to live in a small apartment. Except, I’m not really forced in anything. I can choose how to spend the money I have. It’s no different with including external costs in automobile ownership and use, and ending public subsidies of failing personal transportation infrastructure. That’s the only method of “forcing” people out of cars I’ve ever advocated. We’ve been over this up-thread. PRT vehicles are “small and light” because they are made out of vapor (do not exist… except in Heathrow airport? soon?). Anyway, we would put these things through a regulatory commission before they hurtle around over everyone’s heads like a packet switched network; that’s just the way it goes. But I’ll be happy to join a coalition for making American rail safety standards less insane, which is the real issue. We’re in the same boat on that one. As far as trains running at low capacity, I don’t see them nullifying the awesome efficiency advantage that rush hour trains have over PRT. You can make a case for PRT having good efficiency, but you can lord about saying this theoretical system is vastly more efficient in computer simulations than the one that’s used in the real world. Not if you want to be taken seriously. Oh it will be practical. It may be all we have. But that doesn’t mean it will support moving around 2 tons of metal per person just because people want it to. As I understand it the energy that makes it through our atmosphere is not great enough to match what we get from petroleum (built up from millions of years of that same energy), even if we were able harness it without loss (at least not if we leave any square foot uncelled, like if we want to grow food there or keep some natural ecosystems around). In any case solar energy is going to be more expensive than the petrolorgy that birthed the SUV everyman phenomenon. No disagreement there. Bring in the hard numbers, then let’s talk. There is no evidence to support this. In the 1970s, the proposed light rail system was stopped because the transit commission ended up favoring a 40 seat vehicle — small, but still not PRT. Also because of political infighting not related to PRT. Most recently, the new Hiawatha LRT was constructed and opened during the term of a councilman who from time to was accused of using PRT to stop LRT. Proposing PRT does not equal opposing LRT. The Masdar program plans to use both technologies.